You know, you're right. I'm sure that data from satellites in Earth's orbit are also manipulated by Jovians. There's no civilization on the surface, nor intelligent life. Pay attention not to the giant death laser crater on the Death Star Mimas! The similarity of the so-called Herschel crater with the laser of the Death Star is pure coincidence. In reality, it is the antenna bowl for an interstellar transmission system. Of course, the station has been out of service for a long time. Only a few gyroscopes inside Mimas seem to be still in operation, even if they do not work properly. Therefore the unusual oscillating movement of Mimas. Gotta have big gyroscopes to stabilize the recoil of that giant planet blower upper laser. That antennae bowl only looks inactive. The original shape of Mimas was a mirror-smooth, perfect sphere, with a mirror-polished antenna bowl. In the course of the millennia, the sphere has been somewhat deformed by the gravitation of Saturn, and the surface has been destroyed by meteorites. Therefore Mimas is today not a perfect sphere more. Tree-like aliens are an interesting idea. They would be perfect for interstellar travel. They are long-lived and have a very slow metabolism. Unfortunately, communication with such aliens would be quite difficult. It's the perfect weapon if even Google Translate isn't immune to it. I've never been able to fly with the superman pose. I always have to sort of flap my arms around like a bird. Figures -- I mean they figured out flight long before we did. But superman pose is way cooler. 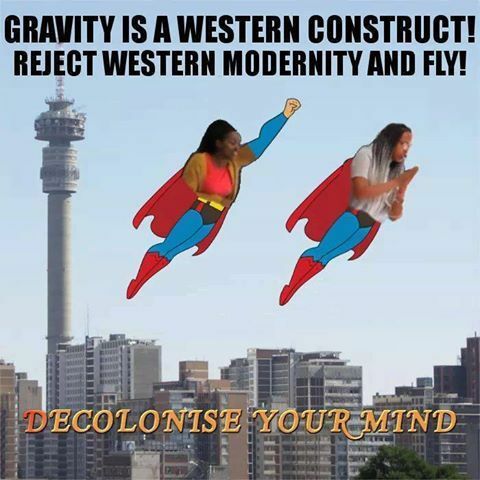 I don't really think gravity is somewhat modern or even western in the first place. This is a pretty misanthropic picture, you shouldn't have posted it. you shouldn't have posted it. I never thought someone's scientific literacy level could be less than zero, but there it is.